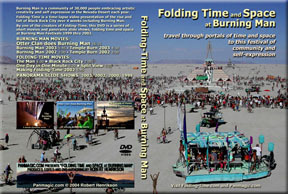 Center Camp 04, Man and Dome 04, Black Rock City 04, Man and Pyramid 03, Man and Lighthouse 02, Making Folding-Time 02. 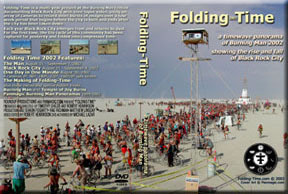 Folding-Time is a multi-year project at the Burning Man Festival documenting Black Rock City with time-lapse video, using an array of cameras to record short bursts of images over a four week period that begins before the city is built and ends after the city has been taken down. 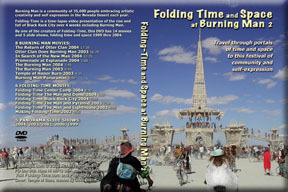 Each year Black Rock City emerges from and returns to dust. For the first time, the life cycle of this community has been captured for posterity and folded into compressed time.